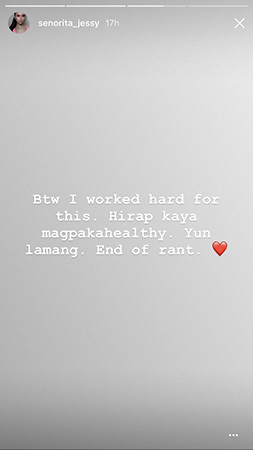 Jessy Mendiola aired out her frustrations over hateful comments she received on social media after she shared her weight loss progress. "Noong malaman ako, dami niyo sinasabi," the actress posted in a series of Instagram Stories. "Ngayon na pumayat ako dami niyo din sinasabi." 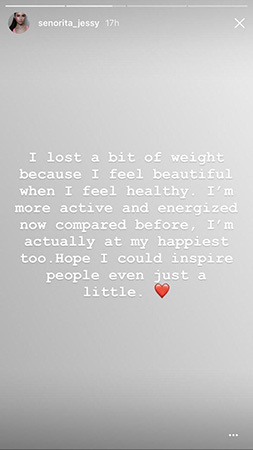 Jessy revealed that she lost 27 lbs. and she's proud of it. 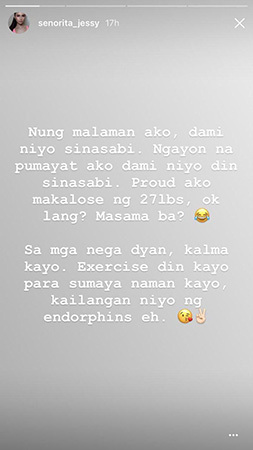 In jest, the Kapamilya star gave suggestions for those sending her negative comments: "Exercise din kayo para sumaya naman kayo, kailangan niyo ng endorphins e."
She also shared the real reason why she decided to lose weight, "I lost a bit of weight because I feel beautiful when I feel healthy. I'm more active and energized now compared before, I'm actually at my happiest, too." Jessy is sharing her road to health because she hopes she "could inspire people even just a little" and is not shy about what it really takes to achieve her fitness goals. "I worked hard for this. Hirap kaya magpaka-healthy."